I read a really good gardening book this week, The Vegetable Gardener’s Guide to Permaculture: Creating an Edible Ecosystem by Christopher Shein. It’s got good basics, easy to follow layout, lots and lots of photos and diagrams, a section on specific plants, and never once does it say, “this is how you have to do it.” It encourages experiment and recognizes different climates, different wants, and different needs. I highly recommend it if you are planning to grow an edible garden. Speaking of garden, what a week it has been! After last weekend’s creative madness, this week has been much calmer, yet there is still plenty happening. Tuesday we had instant summer with a record-breaking temperature of 98F (36.7C), this after we had had a light frost two days before! The rest of the week was still warm but in the comfortable zone. But it was dry and we had to water all our sprouts and new plants daily. Mother Nature decided to help us out Friday and gave us rain. Yesterday too. Now this afternoon even more with the added bonus of a tornado watch, meaning conditions are right to produce a tornado so pay attention to the sky and be alert for the warning siren. I am more worried about hail and straight line winds than a tornado, but they do touch down in the city now and then so it is nothing to scoff at. Good thing I like peas! The warm weather turbo charged seed sprouting. All of the early cool seeds are up: lettuce, spinach, beets, kolhrabi, mustard, pak choi, radish. What about the corn and the peas that the squirrels liked so much? Well, there are only two corn sprouts so we might get a couple ears of sweet corn. So, swishing corn seeds in alum does not work. Note to self: pre-sprout the corn next year. And the peas? Well, you are going to laugh. The squirrels apparently didn’t dig up all of them like I thought. In fact, judging by all the vigorous sprouts, they only dug up a few. So almost all I planted on the first go round and my panicked second planting are giving me lots and lots of peas. There are snow peas and shelling peas so we will have a nice variety. Yesterday afternoon was warm and humid and perfect for planting warm-weather seeds. I planted: pumpkin, yellow bush beans, purple bush beans, scarlet runner beans, cantaloupe, summer squash, cucumbers, and cabbage. I also planted nasturtium in all the garden nooks and crannies. Besides some morning glories and sunflowers that we pre-sprouted in our greenhouse and will go out later this week, everything is now planted. Walter, the crab, has a dozen or so blossoms as does Bea the Honeycrisp. Bea is still a young tree so I don’t expect any apples to form, but I am secretly hoping there might be at least a couple. And Boo the blueberry has blossoms too. Quite a few actually. I don’t know if there will be berries in August since it is still a young, small plant, but the flowers are a good sign. My orange and yellow tulips are blooming and spreading. I have no idea what variety these tulips are or where I got them but they sure are pretty and they look even prettier blooming right along with the pasque flowers (prairie natives). And, I noticed this morning the little dwarf bearded iris is blooming too. My next door neighbor’s lilacs are starting to bloom. I know lots of people love lilacs, and they are pretty, but I hate them because I am highly allergic to them. The neighbor used to have four very large ones and now she is down to three. I think all these years of me giving them the evil eye finally got to them. One down, three to go. Bwhahahaha! Danielle, I’ve got as many ideas as you h ave containers! If you have a somewhat shady porch a begonia or geraniums would be pretty. If sunny, have you ever thought of trying herbs? They can be really pretty. For instance, onion chives that look grass-like and get pretty purple flowers with chamomile which is ferny and gets white daisy-like flowers, and a trailing nasturtium or two that will drape over the edge of the container and come in colors ranging from cream to dark red-orange. French marigolds are nice too. We interplant them with the tomatoes to keep tomato worms away and they bloom yellow all summer long. 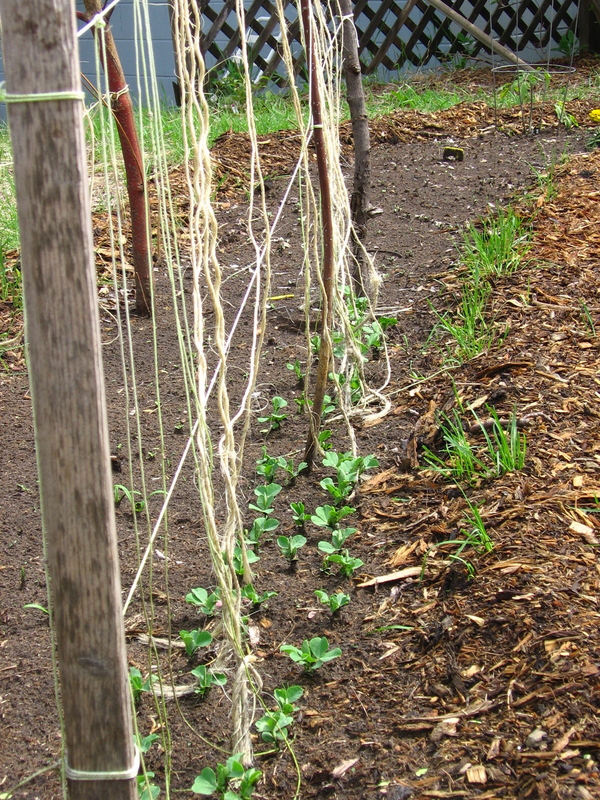 It’s great to see everything sprouting in your garden. It’s still too cold here to plant seeds outside, they’d never germinate. Mind you I don’t know how you and your plants survive the heat. I love your tulips. pining, and I thought I was in a cold growing zone! I hope your soil warms up soon. We don’t usually get that hot this time of year. Hopefully we won’t it that hot again until the middle or end of July. Thanks! The tulips were a great find wherever I got them, probably at a local hardware store on a whim one fall. We planted five bulbs and they have spread to nine, sort of naturalized I guess. 98°F! Wow. I would have loved that — it’s a bit hot admittedly but better than a bit cold! Loved the apple tree. 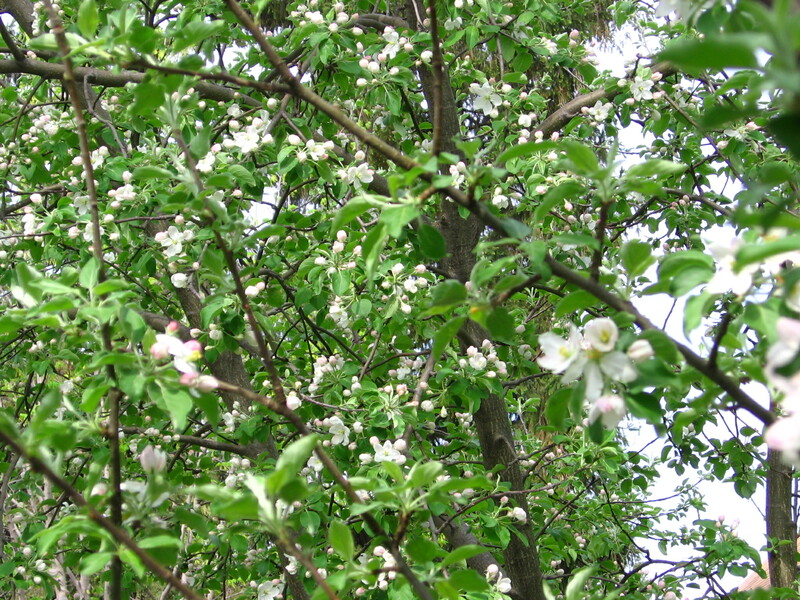 I think apple and pear blossoms are so pretty. As for the lilacs, now I’ve seen your mean streak I’m afraid, very afraid. LOL. Phew, last time I looked I wasn’t a lilac so I feel happier already! Poor you re humidity … and mosquitoes. May you have little of either this summer. We always get mosquitoes, and very large ones at that, this is the “land of ten thousand lakes” after all and so we joke about the mosquito being the state bird. Climate change is making summers here more and more humid because the jet stream tends to dip further south than it used to and as a result pulls in lots of humid air from the Gulf making some days downright tropical. Lovely to see! My pot of mystery seeds has grown and yielded an unsurprising crop of parsley, basil and watercress. At least, I think it’s watercress, it just tastes like a bitter weed, so I’m a bit cautious… Hope the wind stays down where you are! Ophelia, the mystery seeds! Parsley and basil are useful to have. I have not eaten watercress before. If it is bitter though, I think I will skip it. The wins did stay down, thanks, though we had quite a lot of rain. The parsley’s wonderful – it’s wild all through the garden with the oregano. Not sure how big the basil will get before the southern winter is here. Glad you had rain, not tornado! Ophelia, I think I’ll have to plant some parsley next year. Basil doesn’t generally get very large here before the first hint of winter kills it. Thanks! I am glad we just got rain too! The only seeds I planted this year are sunflowers, which I did yesterday. My brother sent our Mom a gigantic basket of flowering plants for Mothers Day that includes several hydrangeas, anthurium, what I think is a kalanchoe, English ivy, what I think might be primrose (maybe? ), and something that might be a type of mum. And some other fill in plants. I should send you a picture while they are still blooming and maybe you can identify them for me. I know I will need to re-plant them outdoors. I am equally confident I’ll plant them in the wrong place, at the wrong time, and kill them. Gosh I hope not. They are gorgeous. Since hydrangeas are shade plants, I expect all of the plants in the basket are shade-loving. I don’t want to blow this, so I’m feeling the pressure of successfully getting them re-planted. I love your garden pictures and look forward to following them as they grow up. Grad, oh I love sunflowers! They are such cheery flowers and the birds love them too. That you can grow all those flowering plants you brother sent your mom outdoors is astonishing to me. Here they are indoor plants except for a few hardy varieties of hydrangea. I’d say light shade for the plants, somewhere they can get morning sun but not be blasted by the heat of the afternoon. And they will want rich soil too. Since your soil is so very sandy, maybe some nice large containers/pots would work well? That way they will get good dirt and you can move them around if you need to. Glad you like the photos. I am enjoying “documenting” my gardening this year. I have never done that before. I’m so glad the seeds are sprouting! That’s such a lovely, exciting moment. And heh, I love the story about the squirrel sabotage not being so efficient as all that, and now you have a monster pea crop on the way. Well, that’s a pretty good problem to have. 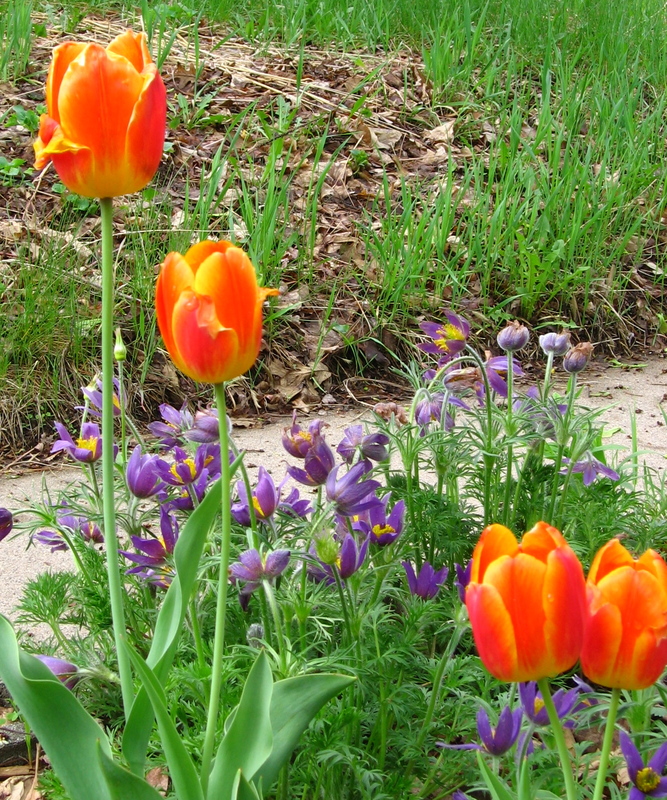 And your flowers look gorgeous – particularly the tulips and the irises. Litlove, it is exciting when the seeds start sprouting, until they do one is always left to wonder and worry. The squirrels were not so efficient and I didn’t need to panic so much. But peas are good. And Bookman, who hates peas, told me last night that he has grown to like them. And thanks! I like tulips especially if I manage to find some reliable ones like these. 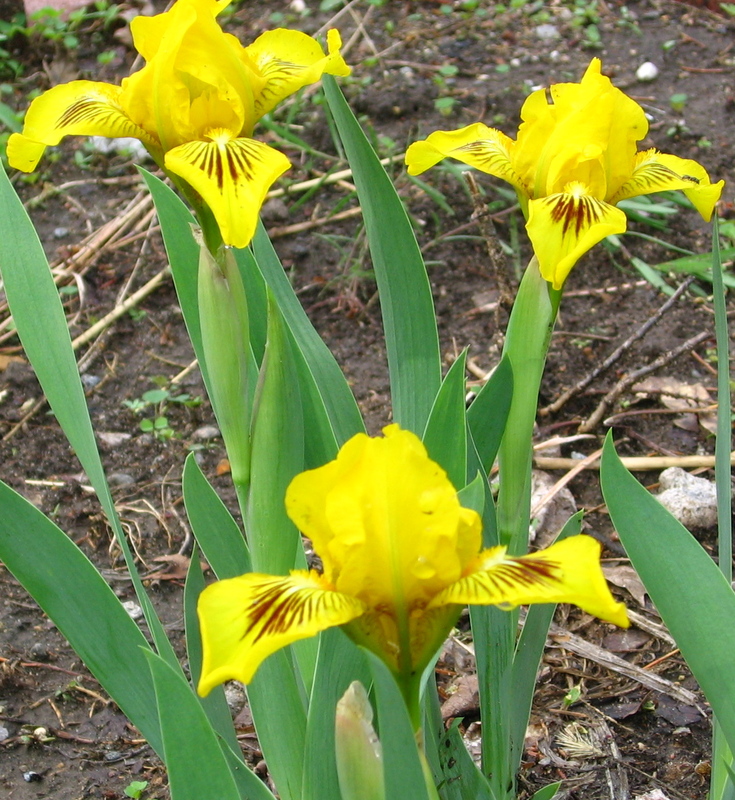 And the iris is always a surprise when it comes back because in my garden then tend to bloom for a couple years and then just stop and only put up green leaves. wherethereisjoy, thanks! Our spring flowers are just in the middle. The peonies will be the last and they got a late start this year because of the long winter so probably won’t be blooming until early June. Then the summer flowers won’t be far behind! If you have too many peas, you can mail some to me 🙂 I think the blooms on Boo are a good sign. We tried blueberries a few years ago (in a former asparagus patch–no wonder they did not make it) and that summer one plant gave us a few small berries. Your flowers are very pretty. Vanessa, one can never have too many peas in my opinion! 🙂 I will keep my fingers crossed for some blueberries. and thanks, flowers do dress up a place. if the temperature of the body is lower than the surroundings. are using with your doctor before using triamterene HCTZ.